A dip in a Perry's Pool Shop pool can be a splashing good time or a tranquil get away. Relaxing in a Perry's Pool Shop spa can make you feel pampered and at ease. With more than 35 years in the business, Perry's Pool Shop can make all of these experiences a reality by providing you with the pool or spa of your dreams! 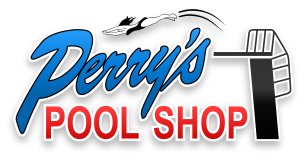 Perry's Pool Shop has been making customers smile since 1975. From our installation of custom in-ground pools to our wide selection of above ground pools and our impressive spa collection - we have just what you're looking for! Perry's Pool Shop is a full service retail operation with in-store computerized water testing. With our products and the help of our professionally trained staff, that dream vacation spot you have always wanted can be right in your own backyard!